And if all that you followed, discovering the likes of Milo and Hector’s was one such delightful experience. Mix and match your (home made) cookies. Mix and match your ice creams. Then mix and match your toppings (yes you need both, don’t ask, you’ll understand when you get there). 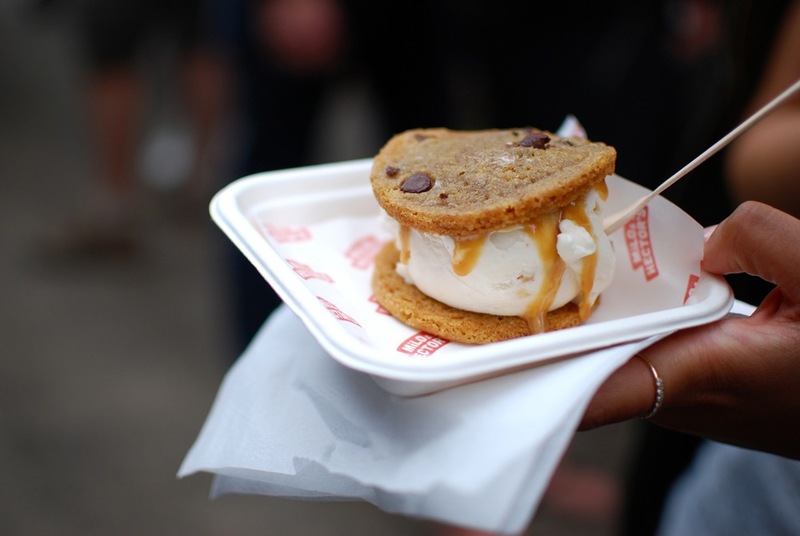 What more could you possibly want in an ice cream sandwich? They also just happened to be served out of the cutest Piaggio: may I present, Giuseppe. He enjoys quiet evenings in underground car parks, Maltby St Market on Saturdays, and checking out the handsome folk in line to see him, because he's just so worth it. Cookies soft enough to mould around the mound of ice cream just dolloped onto your first cookie, hard enough to hold the entire thing together, just, and half-baked enough to indulge all your childhood (and lets face it, adult-hood) cookie-dough fantasies. Did I mention I ran 9k for one of these?